Photographs from Tulsa, OK. First picture on LEFT TOP: garage side view of Hawk Dairies from the 1940's. 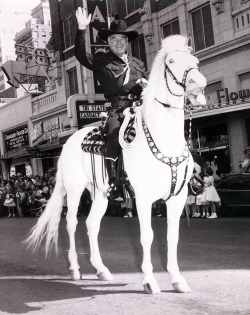 RIGHT TOP: William Boyd (Hopalong Cassidy) appearing in a 1955 Tulsa parade. 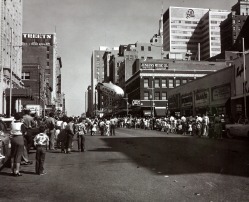 LOWER LEFT: shot of the Spring 1955 parade in Tulsa. LOWER RIGHT: top of a Hawk Dairies pint milk package. 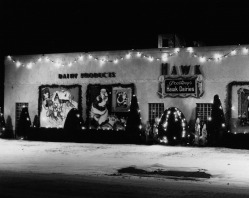 Hawk Dairies operated in Oklahoma, Texas, Kansas, Arkansas and Missouri with headquarters in Tulsa. The business closed in 1961.